In the first match of the series between the Australians and the West Indies at Bridgetown, Barbados at the Kensington Oval, the West Indies won the toss and elected to bat and started well but lost Adrian Barath to Ryan Harris caught by Siddle at deep backward square. The rest of the day however belonged to West Indies losing only 2 more wickets and adding 141 more runs. The second day also belonged to the West Indies batting most of the day with Shiv Chanderpaul scoring an unbeaten hundred with Darren Bravo and Darren Sammy also chipping in with 53 and 41 respectively. Harris was the pick of the bowlers with 2 wickets with part time leg spinner and destructive batsman Dave Warner also getting 2 wickets. 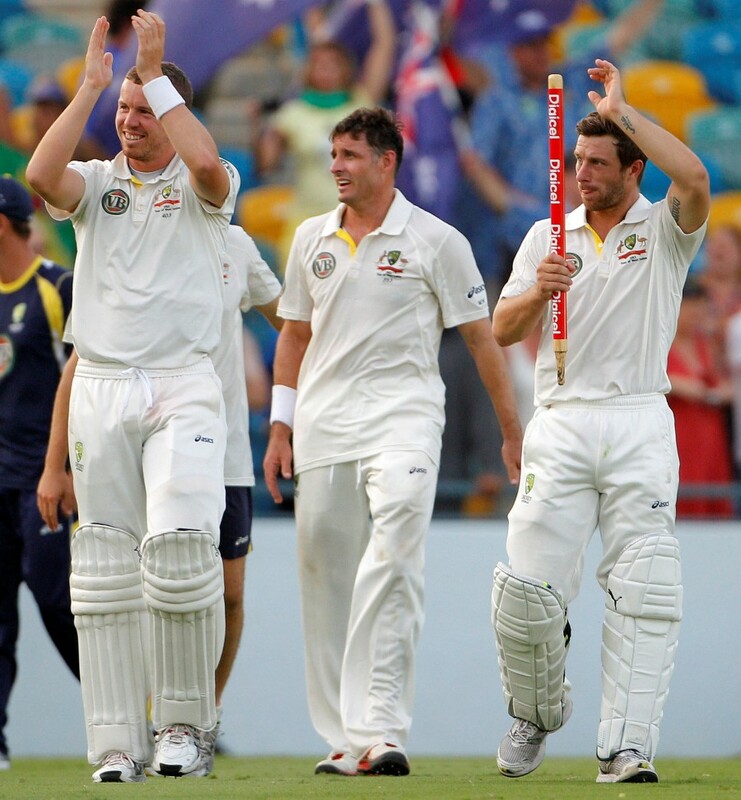 They declared at 9 for 449 giving the Aussies 9.5 overs to bat, they got through easily and made 44 runs in the process. On day 3 the Aussies again looked shaky but this time with the bat, Sammy claimed the first 2 wickets in Cowan for 14 and Warner for 42 before a horrible mix up between Watson and Ponting cost Posting his wicket for only 4. Just as they started to look good Watson fell caught behind to a horrible shot and brought Mr. Cricket, Mike Hussey to the crease. Clarke fell at what looked like the end for the Aussies still over 230 runs behind with only 5 wickets left. Wade and Hussey made it through the afternoon to get to stumps still 5 down. Hussey fell in the 4th over of the day still 200 behind and when Siddle fell for a 6 ball duck just 8 balls later.Wade batted defensively while Harris attacked and the runs behind got smaller untill Wade fell caught at second slip for 28. Things only went up from there through a 44 run partnership between Harris and Hilfenhaus and then Harris put on 76 with Lyon before declaring with the score at 9 for 406. Harris got 68 and Lyon 40 to leave them only 43 behind. The decision was controversial as only 3 teams have declared from behind to win a test match. Straight away it looked great having them 3 for 4 all of them to Hilfenhaus from then on, they were shaky bowling them out for only 148 with Bravo top scoring with 32 and 25 to strike bowler Kemar Roach. Hilfenhaus got 1 more, Harris got 3 with Siddle and Watson getting 2 and 1 respectively. The Aussies chasing only 192 they struggled but got there with 3 wickets remaining. Narsingh Deonarine got 4 and Roach 2 while for the Aussies, Watson top scored with 52 and Cowan got 34. Ryan Harris got Man of the Match for his 5 wickets and 68 not out.